New 600 watt Digital Grow Light Kit: Stackable Hood + Dimmable Digital Ballast + 600w HPS Bulb. What's in the box. 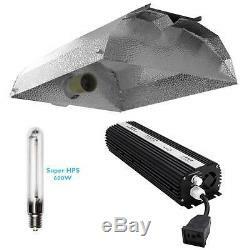 1 x Stackable Hydroponics Grow Light Reflector Hood. 1 x 600W Dimmable Electronic Ballast. 1 x 600W High Pressure Sodium (HPS) Light Bulb. Textured Polished Aluminum Reflector for the best reflectivity and light dispersal! Super Shiny surface reflects 95%+ of light while "dimpled" or "hammertoned" imprints assure even light dispersal over garden with no "hot spots" associated with flat metal reflectors. Versatile: Use with End Pieces to direct every single lumen of light down onto your garden or use without End Pieces as a traditional adjustable "bat wing" type reflector! Sturdy Steel reflector bracket is super heavy duty. Super efficient with ends on the reflector to improve performance. Made from highly reflective textured aluminum for excellent light dispersal without "hot-spots". Comes with built-in UL listed socket and 15' pre-wired lamp cord. Dimensions : 6 H x 14 W x 19 L.
Accepts : High Presure Sodium Bulbs & Metal Halide Bulbs 400W 1000W. 15% cooler than other digital ballasts on the market. Runs on 120 / 240 volt power, 50 hertz / 60 hertz. Fully convertible with both Metal Halide (MH) and High Pressure Sodium (HPS) lamps. Four adjustable power settings: 250w, 400w, 600w and Super Lumin. External breaker system protects against power surges. Comes with an 8 ft power cord. Anodized aluminum fins for maximized heat dissipation. Built-in universal reflector plug; no need for adapters. Internal Resin coating for long life. Conveniently wired with standard hydroponic "S" plug. This Super HPS grow lamp allows you to stretch your growing season to 365 days a year. Fine-tune your lighting system to provide optimum spectral energy levels that promote vigorous plant growth. Super HPS grow lamps provide up to 15% more available energy for plant growth than the standard high pressure sodium lamp. Super HPS grow lamp's enhanced spectral energy distribution is designed to grow a wider variety of plants. Average Rated Life Hours: 24,000. Rated Initial Lumens: 90,000. All listing descriptions as indicated above are based on manufacturers packing information. All defective situations must be reported within 30 days upon receipt of the items. If you do not mark above information for us, we are not able to follow up your case. The item "600 watt HPS Grow Light 600w Stackable Air Cool System Hydroponic Sodium Lamp" is in sale since Monday, October 13, 2014. This item is in the category "Home & Garden\Yard, Garden & Outdoor Living\Gardening Supplies\Hydroponics & Seed Starting\Other Hydroponics". The seller is "gladbuying" and is located in Durham, North Carolina. This item can be shipped worldwide.